NEW YORK CITY — Hundreds of demonstrators marched through the city on the third, somewhat scaled-down night of protest Friday following a grand jury's decision not to indict an NYPD officer in the death of Eric Garner. Rain fell as about 100 protesters gathered downtown on a barricaded section of the steps of Federal Hall, while another 100 people watched. Police officers surrounded the protesters and police cars lined Wall Street during the peaceful demonstration, organized by members of Occupy Wall Street, which involved chants of, "What do we want? Justice." 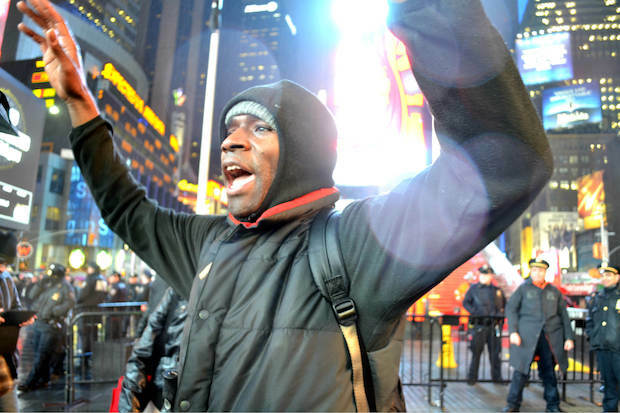 "The real looters are on Wall Street, not in Ferguson," said organizer Sumumba Sobukwe, 46, of the Bronx. "We're here for justice. The people serve the one percent. We're all worried about whether black and brown people are treated fairly." But one passerby who said she heard protesters screaming, "F*** the police," while walking home yesterday was worried about the protest's effectiveness. "It's a very sad situation, but I don't think these protests are helping," said Ann Kelly, 30, who lives and works in the Financial District. "I don't think they've been peaceful." In the meantime, about 100 people gathered in the vicinity of Union Square before eventually marching to Times Square and Rockefeller Center. “People lost their lives so the least I can do is come out in the rain and protest,” said Ashley Volel, 27, who lives in Murray Hill. “I have brothers, I have friends, I have uncles who that could happen to," said Volel, who marched from Union Square to Times Square. "The fact that that could happen to them is the reason why I’m here on these streets protesting." Protests were also planned for Columbus Circle. Social media posts and reports indicated that demonstrators took over part of the Apple store at 59th Street and Fifth Avenue, as well as the Herald Square Macy's to stage "die-ins." Additional "die-ins" also took place in Grand Central Terminal and in Bryant Park, where protesters laid down around a Christmas Tree and observed a few minutes of silent as the rain continued to fall.